You are here: Home » The Studio i for iPad. Is it the missing piece? The Studio i for iPad. Is it the missing piece? On the Studio i home page they state ‘This changes everything’. Steve Jobs might have disagreed and changing everything may be pushing it just a little but this pen may just be the iPads missing piece. Yes that is a bold statement. Does it have a missing piece? It has been well documented the iPad is the first real device that offers the possibility of going paperless. However, for many, while it may get rid of papers, magazines and books it has not replaced the pen and notepad. The normal capacitive touch pen is not a good enough replacement for the pen. It is not accurate and can mean an inefficient use of the already limited space on the iPad. I have mostly gone paperless over the last year. I have been using the capacitive pen and while it works well it often falls down because of the lack of real accuracy particularly when trying to mark up printed documents or diagrams. The Studio i changes that. The pen or stylus has a very slender tip and with it very fine writing is possible. The pen currently only works in its own native app Studio Basic + but that will change in the coming months as other note taking apps incorporate this hardware (see info at bottom on upcoming support). 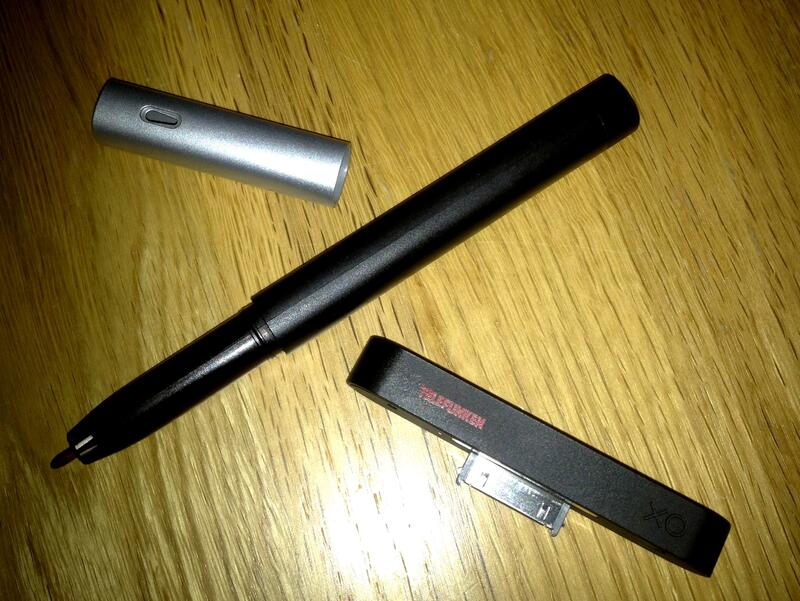 Plug the receiver into the iPad data\charging port and start using the pen. The app is very easy to use and you can very easily change the colour, opacity and line thickness to what is needed. 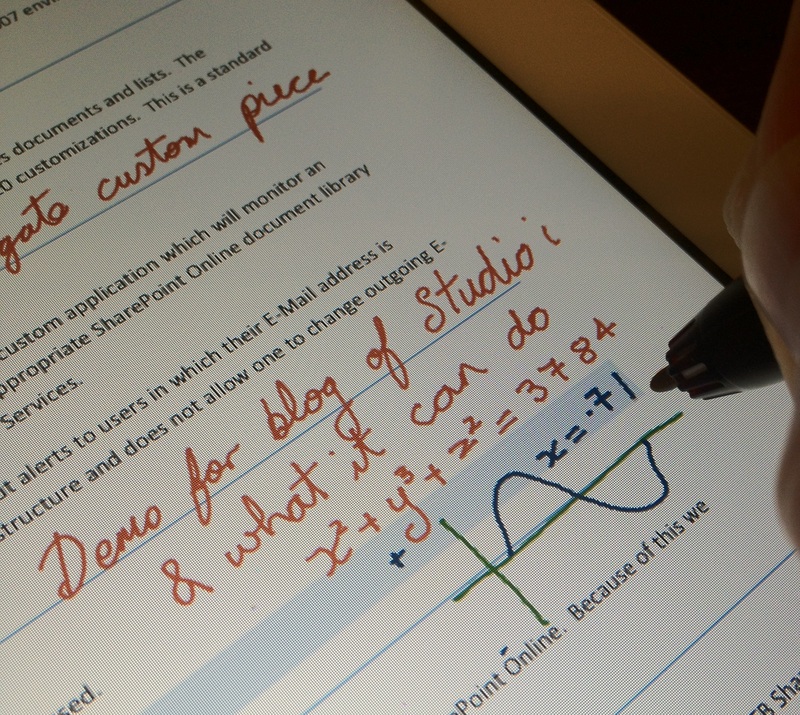 Take a picture within the app or import a pdf and start making notes on it straight away. With all the accuracy of a real pen. The pen like accuracy means that you really can use the full screen efficiently and get the sense of filling a page full of hand written notes. While there are a couple of small things to get used to I have found I am using it daily and have really grown to like and use the app for all notes and reviewing all reading material. Also it ignores finger and palm touches. So you can touch and rest you hand and palm as much as you like and it wont mark or affect you page. with the pen I can mark up PDFs, take meeting notes, jot down my daily tasks, project notes or just doodle. You can then load to Dropbox, share on twitter, Facebook or send by email. You can have multiple notebooks and docs on the go and easily switch between them. If I get a word doc (or other Microsoft office doc)I need to mark up I can PDF it on the iPad using Adobe Createpdf and then open it in Studio Basic and start writing on it. Simple. You have to press down the nib to engage the pen which at the start is a little disconcerting and can be frustrating depending on what you are doing at the start until you are used to it. Hopefully later versions will make it much more sensitive to pressure. All that said I really do like it and its by far the best product for writing on the iPad. I think it begins to close off the missing piece for the iPad. At least the missing piece for me. I am sure as the product and the app develops and other apps take it on board it will become even more valuable. I gave it a quick demo today and one person soon after jumped online and bought one and another 2 people are very interested and want more info. That is from a 2 minute demo to only a few people. It is that impressive for those wanting to really utilise the iPad fully. If you are looking for this product here in Ireland or for any info you should email B-connected info@bconnected.ie – www.bconnected.ie . Its also on amazon.com and I am trying to find out where else for other geographies as I think this would be very appealing for many iPad owners. ← Steve Rixx’s Tech Corner…Glass Is Everywhere In Our Future! That is good news. Thanks for the update. Have you got to try the ipen? I figured my prbloem was I didn’t have an app that could handle the file as I don’t get an Open in option so it looks like I’ll be requesting Pages. I use Dropbox with my note taking app so I understand that one.Thanks! It’s a very nice review. I just want you know that with GoodNotes app you can use in landscape mode. It detects screen orientation and compensates the angle. Thanks for that. Must try it out as I much prefer using the iPad in landscape. Take care. Great article – I am looking to go paperless to improve my productivity at work. I tried an iPad2 wih a standard capacitive stylus and was less than impressed. While it worked, the solution seemed clunky and it felt like I was writing with a crayon. I have two questions… if I am taking notes in a meeting, does the native application allow you to create multiple pages? All the Youtube videos seems to show annotation on a single page. This would be a real detractor if you had to save page by page as you went through the meeting – I take copious notes…. My second questions relates to storing and organizing notes? I go through several notebookes a year. If I were to convert this to digital ink, how do I find the documents again in the future on my iPad? I have a New iPad on preorder, and am looking forward to getting it next week. Does anyone know if this solution is IOS 5 compatible, and will work with the new retina display? Time lag is very severe with the new iPad – to the point of not being acceptable. Time lag issue is in the app as using a finger rather than the Studio pen makes no difference. I have reinstalled the app but problem persists. Yes that is disappointing. I just replied to another with the same problem. Hopefully a quick fix. I dont have any direct links with this company but will defintiely feed back to the products sellers here in Ireland so they can feed back and hopefully get a quick turn around. That is very disappointing. Wit double the memory and a faster processor you would assume it would be quicker but I hope its just a simple software update needed so that it can optimise the new hardware. Hopefully its not too long until its resolved. Could it be lag, that developers are at the mercy of Apples release schedule, and have not had a chance to optimize for their new A5X processor? Using Pen Ultimate and Notes Plus and a standard stylus do not show any signs of performance enhancement with my New iPad. So I do not think the issues is restricted to the by zero products. Fingers crossed that the new wave of app updates will significantly improve stylus writing lag. Does it work with Notability? Unfortunately not… or not yet at least. Just to clarify, the studio pen doesn’t work with GhostWriter, which supports the cregle iPen. The developer has however responded to my feature request stating that it’s already being implemented.